two peas & the dog: food. latkas. *Update: (minutes after I made these) I sent a photo to Nate...he's response: "hashbrowns?". My response: "basically." But you should still try them, because they are good. No, we're not Jewish but I figured Hanukkah was a good time to try making some latkas. They always look so good when I see photos of them. I've never actually had one, so when I say "mine were good" they could actually be crap. I mashed up a couple recipes so I don't really have a "recipe" for you. Just mix grated potatoes, and egg, onion, salt, an a bit of flour in a bowl. Turn on your stove, add olive oil and scoop out the mixture. Turn at about 5 minutes, add more oil. I've figured out oil is the key. Lots of oil will give you Instagram-worthy photos. Oil and more oil. Try adding matzo meal instead of flour next time. 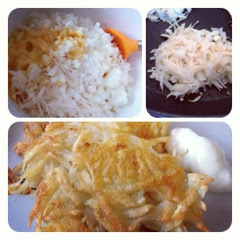 Also, pressing shredded potatoes to get rid of extra moisture makes extra crispy latkes. Were you the apple sauce girl or savory with horseradish and sour cream?